When Ozzie was in the hospital the last time with pneumonia, it was decided that they would finally test his swallow function. To do that, they ordered an MBS – a modified Barium Swallow test. Some of you may have had a barium swallow test done before – i had to have one when i had gallstones… ick! Anyway, the test consisted of a chair like contraption, a bunch of lead aprons, a bottle filled with a barium-formula mixture, an xray video camera, and video imaging of my little man’s skull and throat. The doctors wondered if maybe he was aspirating on his formula… turns out he was, but luckily only a little. This means he is no longer ‘allowed’ to drink formula as is. As is, it flows too fast and it slips into his airway – and he would have delayed aspirations… meaning that he would cough eventually, but not fast enough to keep the formula from entering his lungs. Formula in the lungs = pneumonia = badness. So – the formula must be thickened to nectar consistency. When it was thickened he had what they called ‘penetration’ where the formula made contact with the air passage, but his body and muscles were able to contract and push the formula back out. This is good news… i worried that they would tell me after 8 months and a rocky start of fighting with medical staff for oral feeds that we wouldn’t be able to take feeds by mouth anymore. 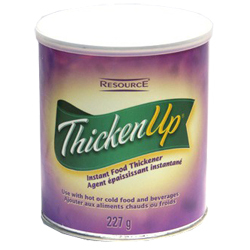 So, now we have to use a product called “Thicken Up”. It’s made by Nestlé, which i’m not crazy about because of their global reputation but what can we do? Necessary evil, i suppose… – it’s made of modified corn starch and it’s added directly to the formula shortly before we feed him. Then it’s a RACE AGAINST TIME to get that formula into him. haha. Just kidding. sort of. The deal is that it continues to thicken as time goes on… so by the end of a feeding session it’s not uncommon for there to be a big ol’ glob of good in the bottom of the bottle. good times. So, here’s the kicker – one container lasts about a week. yeah. dinger. Also? One container costs about 8 or 9 dollars. Also? Forumla costs between about 18-28 (depending on sales and coupons) a week. Now to feed Ozzie it costs us around 30 bucks a week! so, 120 a month…. break out the calculators, i’m not a math-a-magician but i’m pretty sure that’s like a billion trillion dollars a year. also? what gives? why can’t i find this stuff on the west side? i went to two pharmacies and Walmart and Supserstore and NADA! So, that means that today i get to pack up the kids and drive to the east side and go to a medical supply store and buy a case of 12 if i can. This entry was posted in feeding, formula, thickener, Uncategorized by ozziesmama. Bookmark the permalink.